Players have attained super-stardom and handsome riches over many years due to their innate ability to communicate with and to coach animals of all different species. Now the greatest animal coaches from around the world (the participating players) have gathered for the ultimate test of their training prowess to see who will become The Champion of the Wild. Three events are first selected - one from each of five different categories (speed, power, endurance, technical and team). 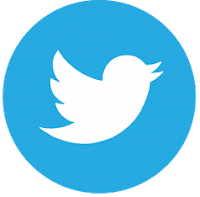 These events can be any measurable activity, examples including the 100m sprint, high jump, ballroom dancing and hide-and-seek. 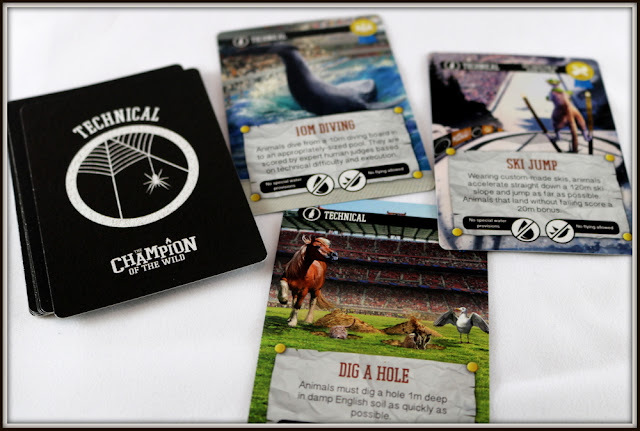 Players are then dealt a hand of animal cards to choose from and must select one single animal to represent them across all three events, competing against the animals selected by the other players. 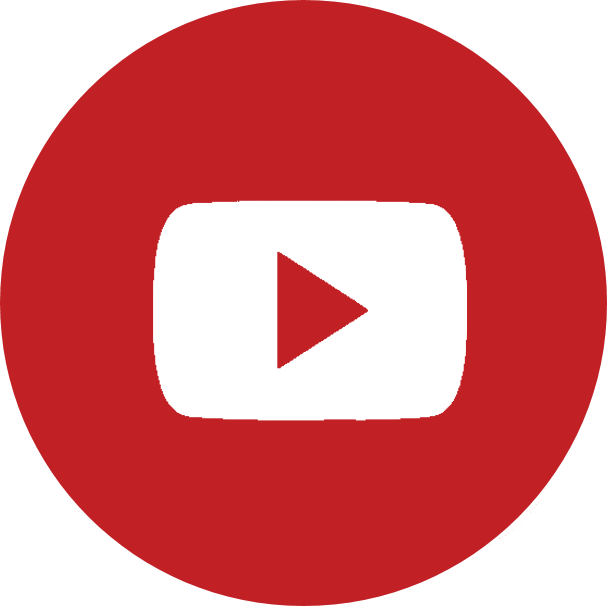 These events are then played out by way of animated discussion and players then vote according to their opinion on the likely rankings (excluding their own animal when voting). Votes score points for the appropriate players and the player with the most points after three events wins. 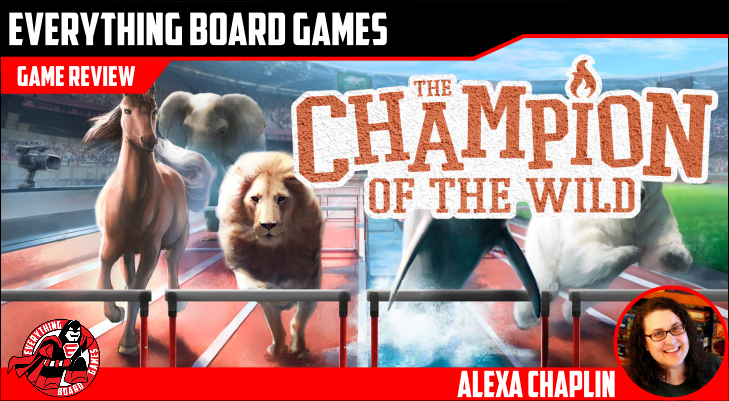 This copy of The Champion of the Wild was provided to me for the purposes of this review, but the opinions here are my own. WARNING: This is a review of the sold-out first edition of The Champion of the Wild. 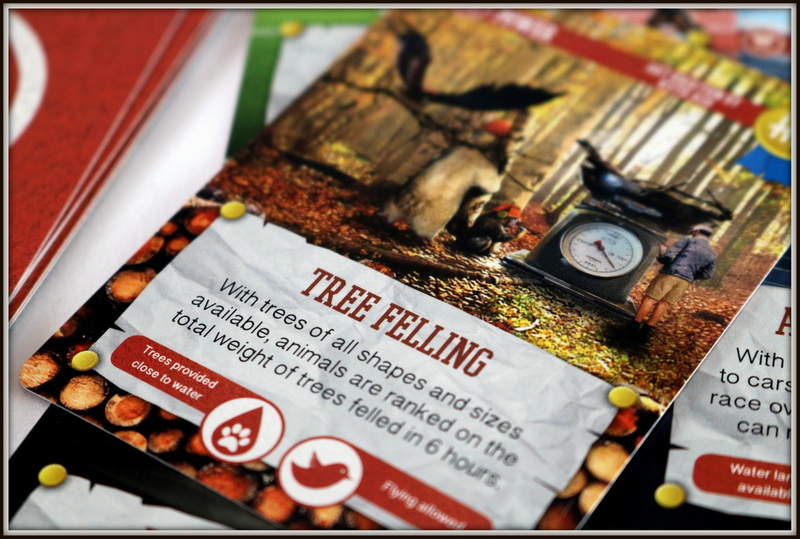 The Kickstarter for the second edition of the game launches on January 28, 2019.
Who could dig a one cubic meter hole faster...a sea turtle, a hare, or a beaver? Who would win in a 100 meter sprint...a kangaroo, a horse, or a basilisk lizard? Which animal could resist eating a cake covered in its favorite food for longer...a grasshopper, a hummingbird, or a great white shark? If your mind is already turning with what arguments you'd make in favor of one of these animals winning one of these competitions, then you're already ready to play The Champion of the Wild! 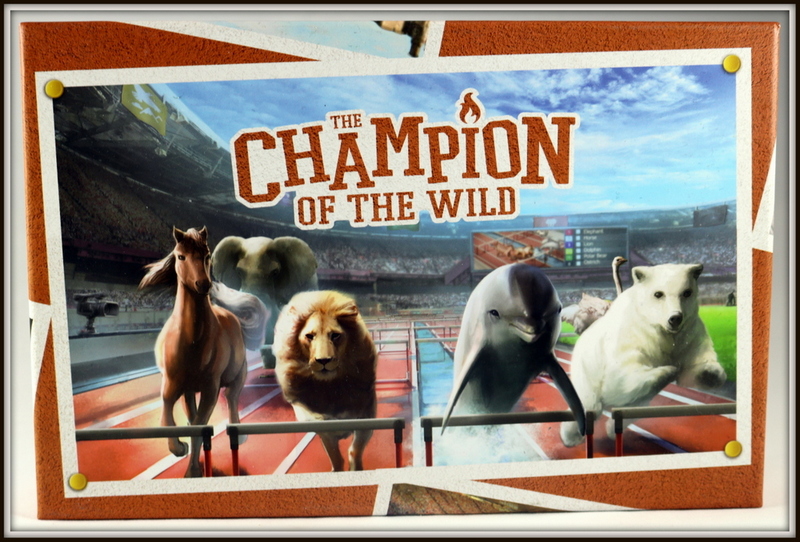 The premise of The Champion of the Wild is out-of-the-box thinking: choose an animal which you think could best compete in a particular series of unusual events. 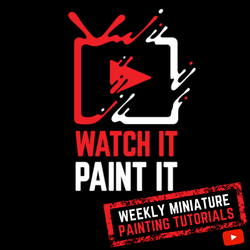 One by one, the events will be announced and discussed, with plenty of time for you to explain why a kangaroo would outpace a horse, or why that sea turtle's egg-laying and sand-digging skills would lead it to beat out the quickly-tiring hare in digging a hole. Players vote, ranking the other animals (not their own) in each competition. 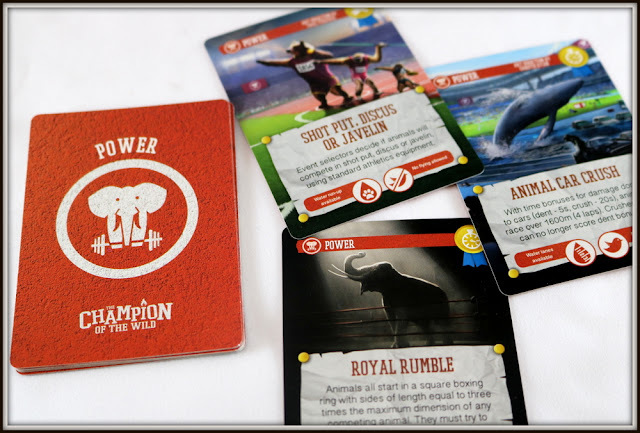 After a full slate of three competitions, tally up all the points your animal has won across all the votes, and the animal with the best ranking is clearly the victor and the true Champion of the Wild! 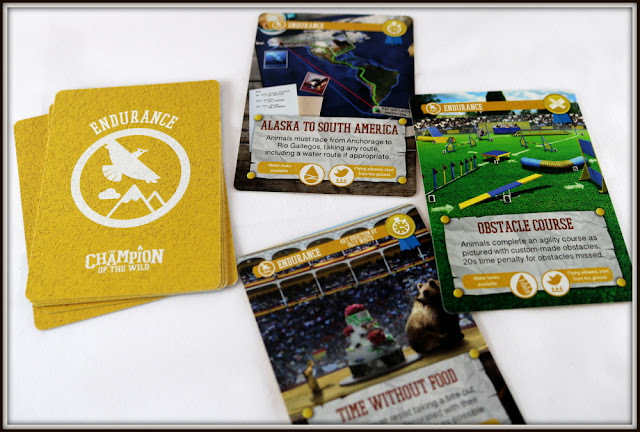 The main components of The Champion of the Wild are the cards: one big deck of 50 different animals, complete with name, classification, and height and weight stats; plus 5 decks of events of different types (Speed, Power, Endurance, Technical, and Team), with descriptions and icons to indicate special rules for water or flight plus the main scoring factor. 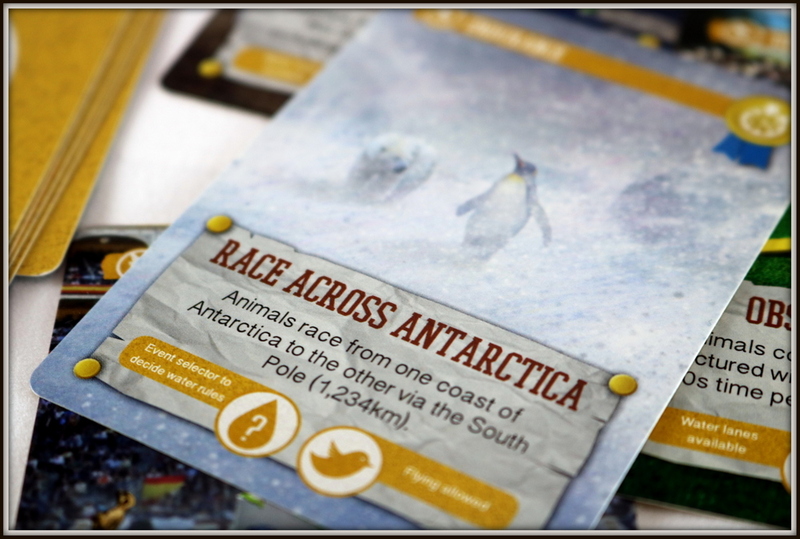 The cards are glossy and sturdy, and the artwork is highly detailed and eye-catching. 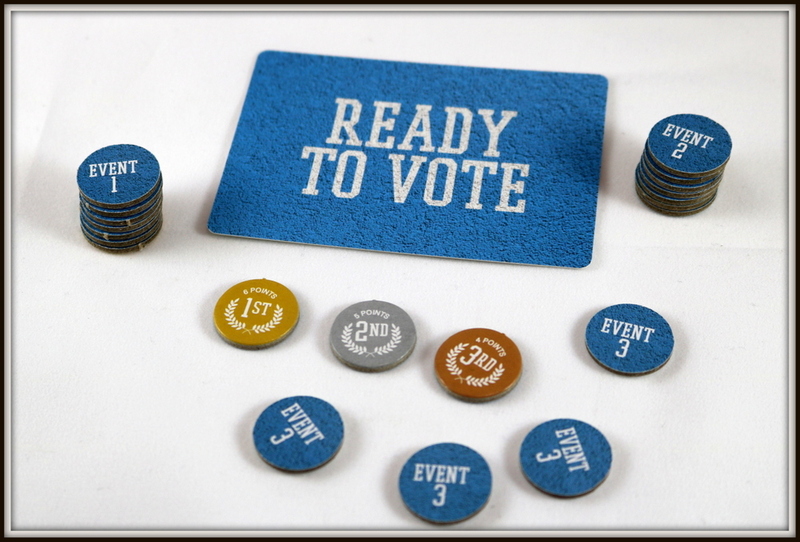 In addition, each player (up to a maximum of 8) will have a Ready to Vote card and 21 cardboard tokens--1st through 7th place for Events 1, 2, and 3. The tokens are definitely the fiddliest part of the game--they take quite a while to punch out and although they sit nicely in the box insert, they take a bit of time to hand out at the beginning, because you only need tokens based on the number playing (in a six-player game, you only need 1st through 5th place for each event), and they are the most time-consuming part of packing the game back up in the end. Once the tokens and Ready to Vote cards are handed out, you will choose three Event Selectors for the game--these are the players who will get to pick the three events and make judgments on rule clarifications. Each Event Selector draws 3 cards from the top of one of the Event Decks (each choosing a different deck), and then reads the three potential events and chooses the one they like best. 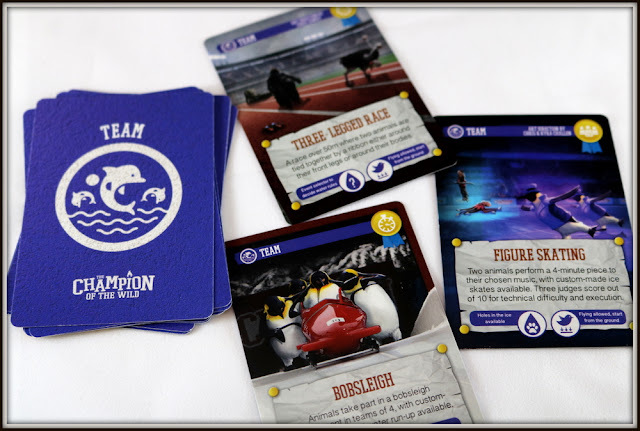 One at a time, the Event Selectors will read their event cards and field questions about unusual rules, making sure to check the event card for rules about flight ability and water availability! After each event has been discussed, you're ready to get into the heart of the game. You're an Event Selector, and you picked the Speed category. Which event will you choose? Slip 'N' Slide - Animals must slide as far as possible on a wet plastic sheet, using the terrain of their choice for the run-up. 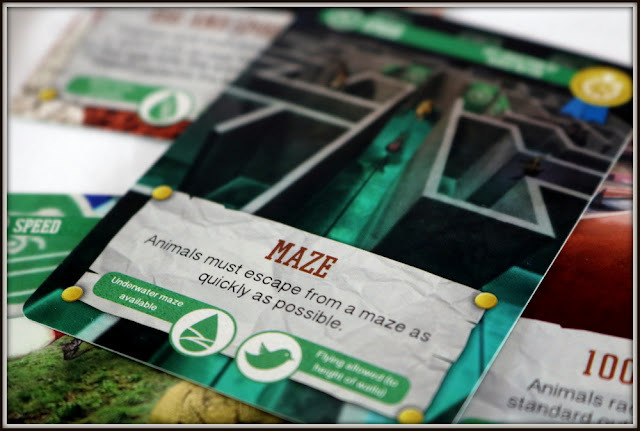 Maze - Animals must escape from a maze as quickly as possible. Cheese Rolling - A wheel of cheese is released down a steep hill and animals race to touch it as quickly as possible, as in Cooper's Hill Cheese Rolling event in the UK. 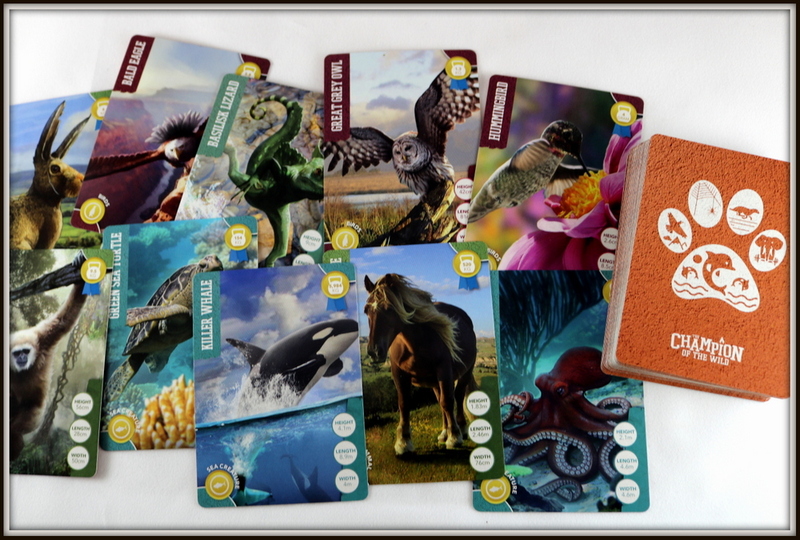 Now that all players know what three events are in today's lineup, everyone receives 8 animal cards from the deck, and must choose the one animal to best represent them across all three events! This is where the difficult decision-making comes in. If the events include the Race Across Antarctica and the 50 Meter Swim, you may really want to choose your Emperor Penguin, but does knowing that the third competition is Tree Felling sway you in a different direction? 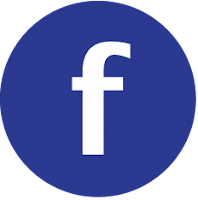 Will it be enough to score very highly in two events and scrape by in the third, or are you going to look for an animal who will do moderately well in all three? Take your time to choose the very best, because you'll have to defend your choice! This is the most delightful, engaging part of the game, where active players indulge in good-natured bantering, arguing their reasons why an elephant would clearly outscore an ostrich in figure skating. 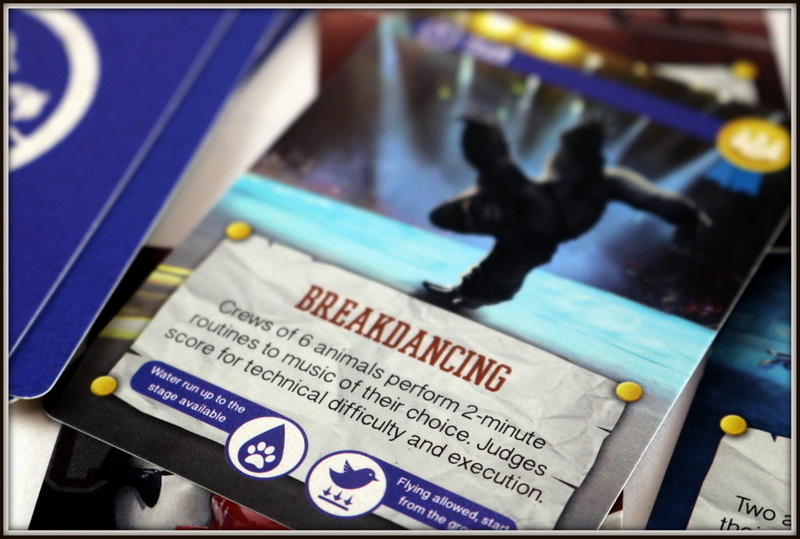 After the open discussion, all players will secretly cast their votes by passing their voting tokens to the other players, not revealing yet which animal took which place. The game continues with the second and third event, and at the end, players reveal their total scores for each event (extra fun if someone in the group wants to step up and help announce this, sports-network style!). 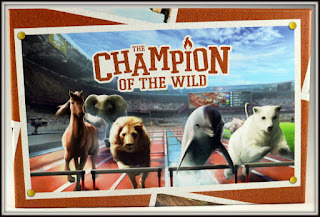 The animal with the highest overall score after three events is crowned The Champion of the Wild. 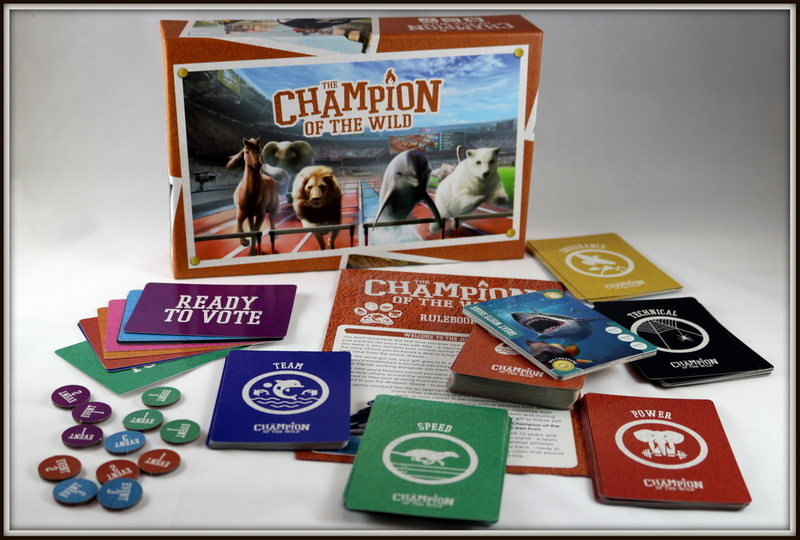 The Champion of the Wild takes a favorite game mechanic--debating your position and voting--and adds an engaging layer of real-life animals and hysterical competitive events. 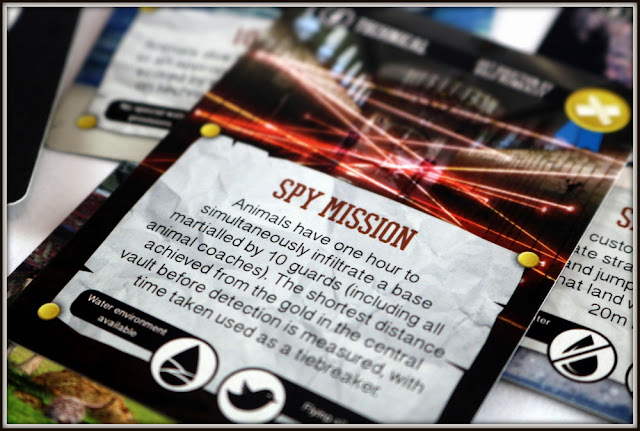 Fans of long, twisty, late-night conversations and other voting style games will slide right into the easy-to-teach gameplay while enjoying the animal theme. 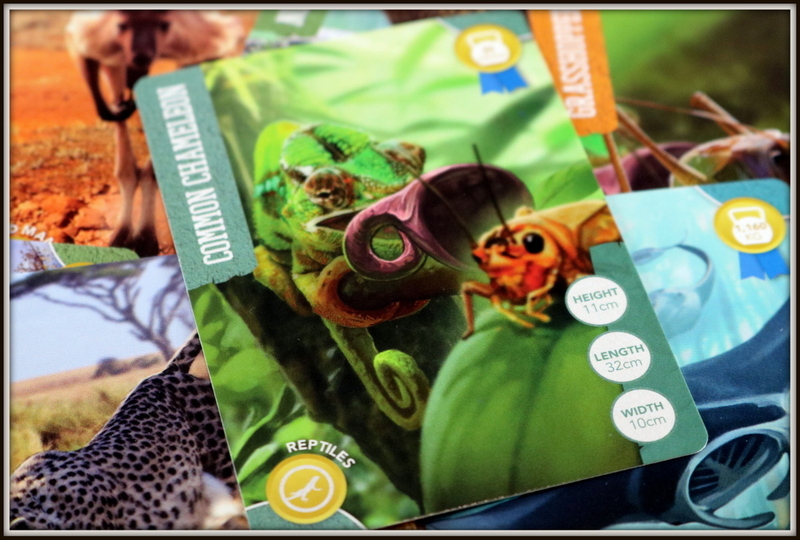 I have used The Champion of the Wild with my Gameschooling ELA group--a gathering of elementary students who use games as a way to strengthen their verbal abilities. The kids loved being able to choose funny combinations (a giraffe riding a mechanical bull!?) and argue for the winners, and the game encouraged their thinking and debating skills. The only part of The Champion of the Wild that is difficult is dealing with and sorting the various voting tokens. 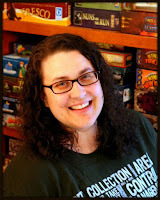 I'm not sure if there is an easier or more elegant solution to make set-up and tear-down easier, but the tokens certainly don't deter us from play or lessen our enjoyment of the game. 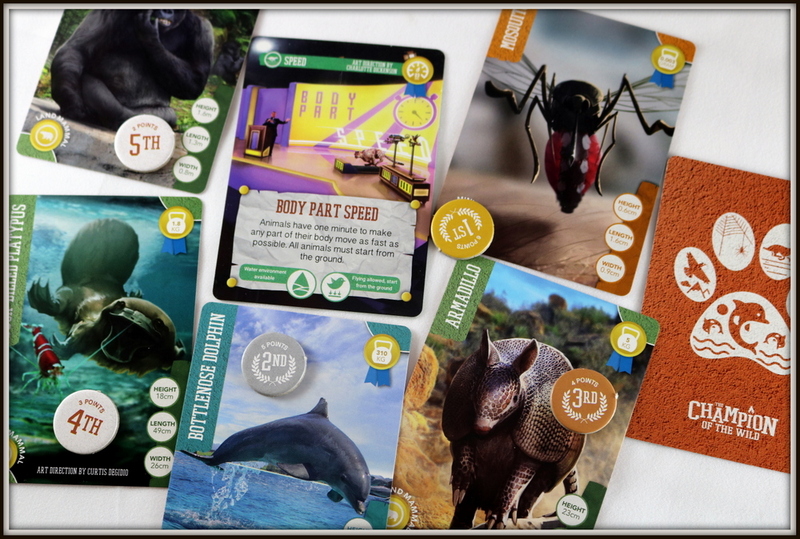 Players who love to debate and present their case in games like Snake Oil or Wing It will enjoy the same format with a new wild animal sporting theme. 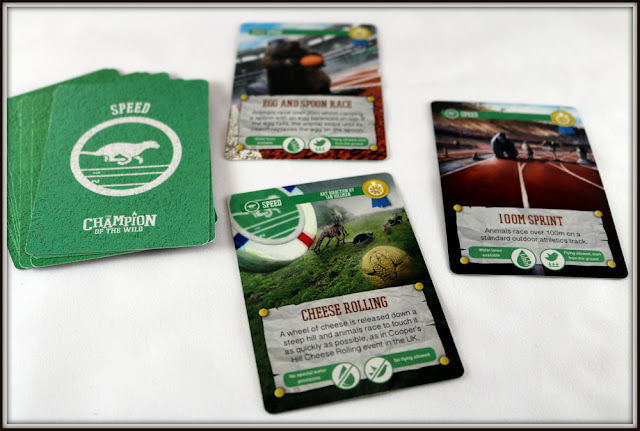 Even though the cardboard voting tokens take a little extra time and attention, The Champion of the Wild has been a hit with every group I introduced it to. The Champion of the Wild is a great way to sink your teeth into a good-natured argument over some of your favorite animals tackling weird and wacky competitions! It's a keeper here, for sure. 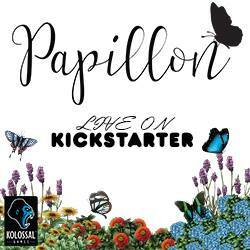 On KICKSTARTER now. Campaign ends February 22.